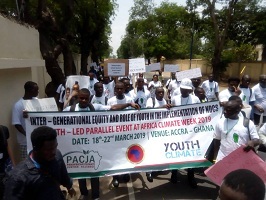 The fourth day of the ongoing Africa Climate Week took a different swing as hundreds of African youths representing the Youth Wing of the United Nations Framework Convention on Climate Change (UNFCCC) took to the streets of Accra, Ghana for the Africa Climate March. 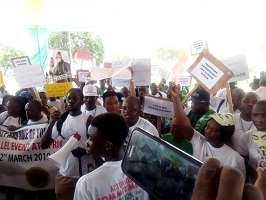 The March begun at the Holy Spirit Cathedral, Accra around 09.35AM and ended at the Accra International Conference Center, Accra, Ghana. 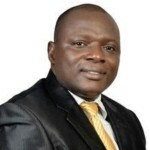 The youth contact person for Pan African Climate Justice Alliance (PACJA), Mr. Dickson Kithinji stressed the need for African Youths within the Climate discuss to truly groomed capacity-wise to birth climate solutions. A climate March statement issued by Maria Auma on behalf of the group read: “Everyday, youth around the world are gearing up to demand for climate justice and climate action. 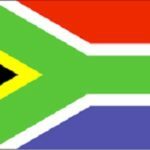 The growing movement is now in Africa, with young people taking to the streets in peaceful demonstrations to place pressure on their governments to increase ambition. But, it is not just about increasing Nationally Determined Contributions (NDCs), or sitting in boardrooms in front of policymakers to talk about our continental Adaptation Plans. It is about securing our future, protecting our livelihoods and saving the one planet that we call home. We walk on the streets to demand for change. We walk on the streets to put a face to this terror. Climate Change is no longer a myth. It is that dark monster knocking at our doorsteps in broad daylight telling us that maybe tomorrow the homes of our brothers and sisters in small island developing states may get washed away by rising sea levels. It is that looming drought scourge that extends for more than two months and threatens the food baskets of Africa. It is the abnormal rising temperatures in the night and in the day that result in heat strokes for babies and increase the spread of diseases. Are we going to sit back and do nothing? Or will we push back and say enough is enough! No more do we want to stand on the sidelines and watch our governments negotiate text of what our future will look like without including us. In this age of digital technology, globalization and multilateralism, we are demanding to be heard, demanding to be included, demanding for real action. We need our leaders to pay more attention to adaptation and loss and damage, to take responsibility and ownership at home within our national budgets and the private sector so that we can implement strategies towards climate neutrality. 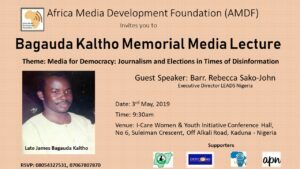 National dialogues must meaningfully involve young people, otherwise what is a stakeholder consultation, when the key stakeholders that matter are absent from the room? We are tired of the status-quo, of being locked out of meeting rooms where decisions are made. It is ever so easy to bracket and delete crucial texts on contentious issues that appear too difficult to deliberate on. Gone are the days when contexts like financing, carbon pricing and clean development mechanisms were left for those older than us to demystify. We are an informed and educated generation with innovative ideas and solutions that work. Listen to us! Support us! We are a youthful generation and we make up nearly half of the world’s population.